Since today you are able to search for millions of airfare combinations trough more then 400 airlines across the world and book tickets for free. All above mentioned is available by Wanderlust 1.1,new app released by Tidal Pool Software for Apple iPhone and iPod touch. This app provides savings of up to 60% that includes 20 million consolidator fares and over 40 low cost carriers from Asia and Europe with fares starting from 10$. 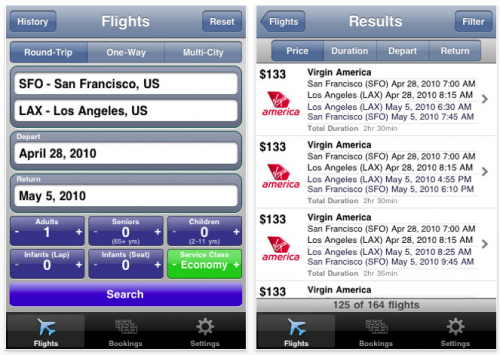 Wanderlust is the only iPhone app to support in-app flight bookings. It offers simplified flight search and booking user interface. Besides, support to search for nearby airports had been added to the app. Quality of the performance while searching or browsing has been improved by shaking the device. Other features include: search history to quickly recheck fares, email and manage flight bookings, browse first class, business, and economy fares. Wanderlust 1.0 is free and available exclusively through the US and Canadian App Stores in the Travel category.